There’s nothing more exciting to an author than the thought of someone wanting a signed and personalized copy of their book! I like to imagine someone unearthing a paperback copy of The Last of the Ageless and guessing at the meaning behind the message anytime I get the chance to pen something fun on the title page. Thanks for making my day more exciting! You can also meet me in person and I’ll sign it for you right then and there! My local bookstore, Park Road Books, will gladly ship a signed copy of The Last of the Ageless anywhere in the world. That’s all you have to do! Then Park Road Books will summon me from my lair for my autograph. To be doubly sure I get the correct spelling and message, email me, too. Or you can buy the ebook on Amazon.com, usually for around 1/3rd the paperback price, and send it via email to your friends or family on the date you choose. Amazon will deliver your gift within 24 hours of whatever date you selected. They’ll send your gift recipient an email with the subject line A Gift From Your Name with a big yellow Get your gift now button (as shown below). You can also complete your friend’s collection by buying the short stories. Amazon offers instructions on how to use the free Kindle reading app if your friend doesn’t have a Kindle device. The Last of the Ageless is optimized to read on a smartphone using the Kindle app — that’s how I personally read everything, after all. Here’s what the email to your friend or family will look like. 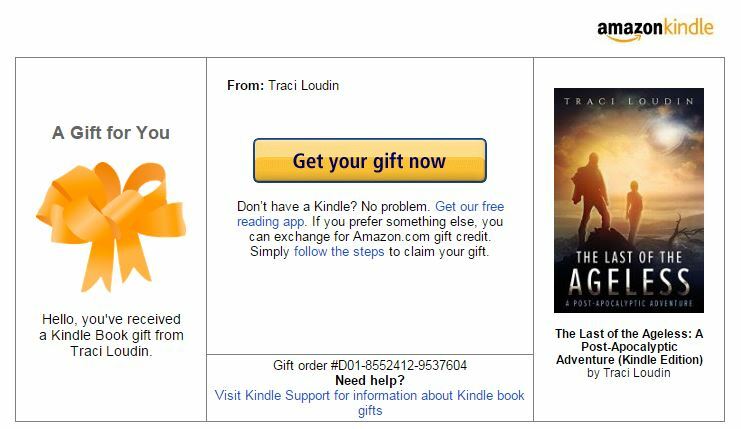 Of course where it says From: Traci Loudin will be your name and your personalized message, if you added one. **Here’s a trick… Instead of entering your friend’s email, enter YOUR email address. Choose “Now” as the delivery date. Once you receive the email, print it, fold the paper into an origami, put it into a tiny box, and wrap it! Or if you prefer, just print out the book cover image and wrap that instead. If someone sent you an ebook as a gift, hit the big yellow Get your gift now button. You’ll land on a page that looks like the below image. 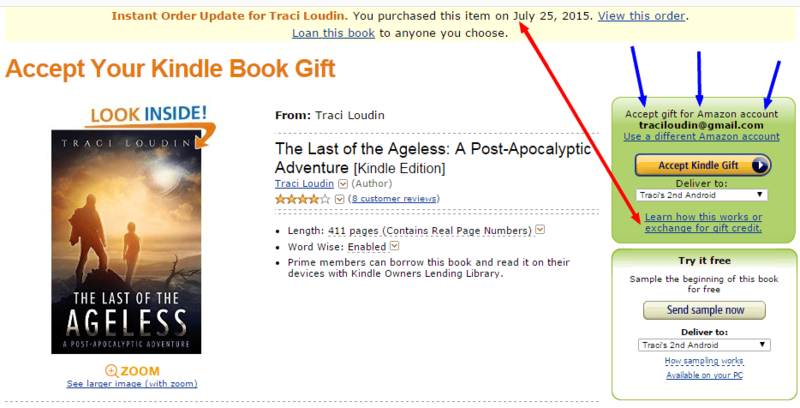 In most cases, you should just be able to hit the yellow Accept Kindle Gift button (see blue arrows). You can also hit the Use a different Amazon account link if you’re not logged in to the right account. If your friend bought you this book but you already own it (see red arrows), you should hit the Learn how this works or exchange for gift credit link. I hope you enjoy reading The Last of the Ageless. Feel free to let me know how you liked it!